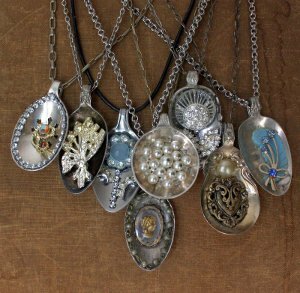 Turn old thrift store spoons into these adorable Vintage Spoon Pendants. These cute DIY pendants are great to give as gifts and are a fun way to play around with all your favorite beads, baubles, odds, and ends. The great thing about vintage jewelry patterns like this is that no one is like the other, so you can create original pieces for all your friends and family members. This pendant is truly one of a kind, and is a great way to reuse grandma's old jewelry or an old spoon that you stumble upon in your junk drawer. Discover this project and others like it in 19 Spoon Crafts: Wooden, Plastic, Metal, and More. I always use E-6000 glue for such projects. The proper way to use E-6000 is to apply the glue to the area, then slide your item onto the glued area. It creates a better bond to slide the item rather than simply placing it onto the glued area. Some of the items I glued into the spoons were earrings with the backs removed. Some of the other bits were small brooches. The pinbacks can be easily removed with wire clippers. The pendants would look fine on a simple black cord or silver ball chain. A more elaborate beaded chain could be used too. The possibilities are endless! Love vintage-inspired patterns? Check out these other awesome projects! I am probably telling my age but I remember when there were jewelry items made from spoons. I do not recall ever owing a piece but for a while they were a thing. This is a cool idea and I just love them in a grouping as shown here displayed. I guess to get the full effect it would be best just to wear one on a chain at a time. 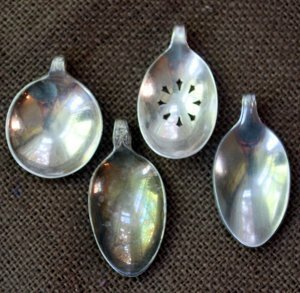 What a great idea to use some of those vintage spoons that can be found in your local thrift store. I think that if you are lucky enough to find some in baby versions you will really have something very special. I love vintage crafts because you almost always end up using some of your old jewelry. if you have shiny jewelry but want that rustic look, you can fade that shine using some hard boiled york. The best part about this craft is you can get these spoons from the dollar store. Again, we have this draw to all things vintage. I think it is because it feels familiar and comforting in a way. I would have a ball going to the thrift store, rifling through old jewelry boxes with bits of junk in there. Each mismatched piece is a treasure to be had. This is the kind of stuff you see all the time at the street art fairs. Once you make the handle into a ring, you have a matching two piece set. This is great! These are lovely and very ingenious. Great job! Love 'em!! E6000 glue can be found at any craft store. I see it at a lot of other stores too. Look in the glue section or in hardware too. I like the look of the finished pendants. What would be the best way to keep them clean? It looks like it might be difficult to get around/in between some of the attached items. R there any pictures of the project, all I see are video advertisements. 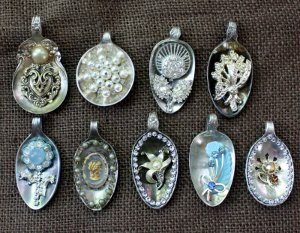 Several years ago, I made angels out of the spoon handles, using the handle for the body, and adding wings and halos from a jewelry craft site. I put a pin on the back. where does one find E600 glue? Walmart carries it in a 2 oz. tube or a package with 3 smaller tubes. I have a spoon handle keychain fob as a leftover from a spoon. The ring idea sounds great! I love the pendant idea too. It looks very creative and simple at the same time. What a great idea for the bowl of the spoon. We used to make rings out of the handles. This was in the '70's. We called them spoon rings. Love this idea! And we have a hack saw....and lots of other tools! I love tools! And i love E-6000!! Thanks for sharing! Many years ago my mother and I made rings using the handle end of spoons. There was some sanding involved to the cut end. We used a piece of pluming pipe and a small hammer to shape the handle into a ring shape letting the end be the decorative top of the ring. The ring was adjustable to fit. This could go good with the pendents! Neat idea. But I would also like to see some ideas for using the cut-off part (handles) of the old spoons. Sometimes they have very decorative patterns. A great idea but I don't know too many people that have a hacksaw that they can just whip out and use for such a purpose. I'd be more likely to do this craft if it were based on standard jewelry-making tools. Don't let the lack of a tool stop you from doing this craft if it appeals to you. A hacksaw need not be expensive; you can purchase one for under $10. For about $15, you can get 10 replacement blades, which you will want if you start using a hacksaw on a regular basis. In fact, I would buy the saw and the extra blades at the same time, so when the blade is worn enough to no longer be useful, I could replace it immediately. The saw blades do bend, break and just plain wear out, which should be expected. Yes, there are more expensive saws, but you don't need the more expensive tool for this purpose. swjo75 8647670 - if you bought a cheap little dremmel tool it has various ends that will smooth the spoons sharp edge. I like this very much and would like to make some of these. After you used a hacksaw to cut off the excess spoon handle, how did you smooth the cut area? 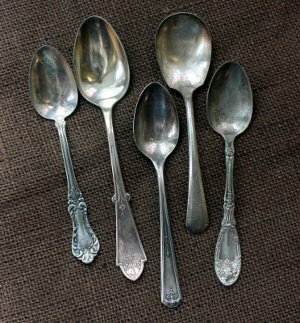 This is something that I will have to try..I have some silver vintage spoons.